The bus was packed from S. Higashiyama to Arashiyama. We were lucky enough to get window seats. A small group of high school girls stood beside us and overheard JD and I talking in English. “Oh! You speak English?” Thus began the delightful thirty-minute conversation we shared where we discussed Japan, America and our interests. They snapped a quick group selfie with us before their stop then waved goodbye to us through the window. It's amazing how interested and willing they were to speak with us in English. They recognized it as an opportunity to practice a new language with new people rather than fear it. The Japanese are incomparable in their hospitality. The ride into Arashiyama is exhilarating. I wasn’t able to take photos but it’s an image we will (hopefully) never forget. A river flowed along the road with autumn trees lining the Japanese mountains. I could sit there for hours taking in the beauty. We planned on starting at the Bamboo Forest but we accidentally passed by the entrance. When we finally stopped to get directions, we turned back around and started the day off with a coffee break instead. The Bamboo Forest entrance is a little hidden but we finally found it near the north gate of Tenryu-ji. We’re also pretty certain we missed most of the forest. Don’t get me wrong, we saw a LOT of bamboo (and it was awesome) but the path we took lasted less than .5 mile. It was a rough morning for the Todd Navigation Duo. 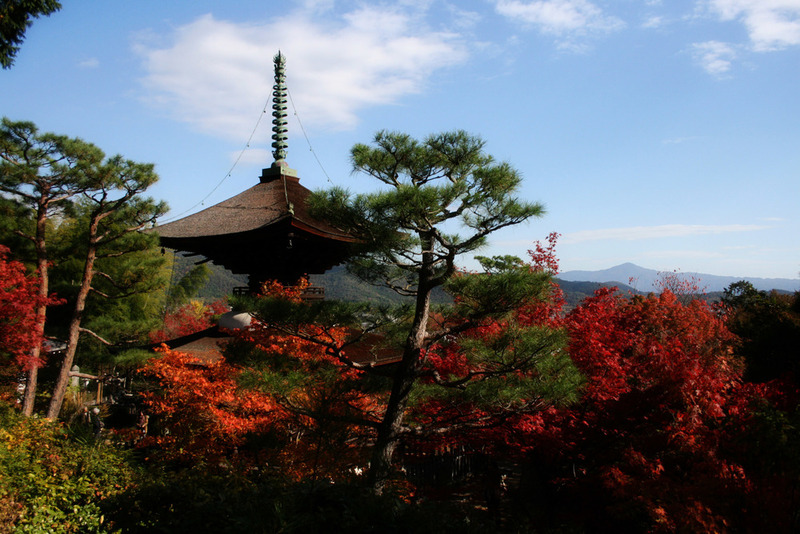 We quickly found our way out of the forest and headed toward Jojakko-ji, a temple perched on top of a mossy knoll. The photo below isn't great quality but I LOVED how the moss covered the gate's roof. Nature's inspiration at its best. We stopped for a fancy bowl of noodles at Komichi and were not disappointed. This is one place we would definitely eat at again. In other words, we had nowhere else to go. We hiked up to another road and waved down a taxi that drove us to Kinkaku-ji (aka: the Golden Pavilion - we'll post about this next). Between the hills and long distances, there was a lot of walking this day. So much that I thought I wasn’t going to be able to get out of bed the next morning. Even my Crossfit, buff-of-a-husband was a little sore. Our navigation skills failed at the end of the route when we couldn’t find the correct bus or hail a taxi. If you take this route, I wish we could give you better advice but we ended up walking another solid mile before finding transportation back home. By the time we finally got back to the house, we were filled with nothing but laughter. After a full day of poor navigation but breathtaking sites, there’s no other reaction you can have.